best of rich entertainment, synergy and warmth. After the success of the first edition, D’lyte has put in more effort to make sure that this year’s edition comes out better and richer. The super woman crooner D’lyte said hardship in the society and struggles in the industry has made it difficult for creativity and great talent to thrive. Also the music industry is not properly structured, real and great talents are wasting . It hurts to see great talent fade away. This is what brought about D’lyte and D’stars and it’s sole aim is to create and provide a stage for real talents who do not have a means of developing and promoting their craft. It is designed to reduce idleness and increase self-employment by harnessing the teeming talents in the society. 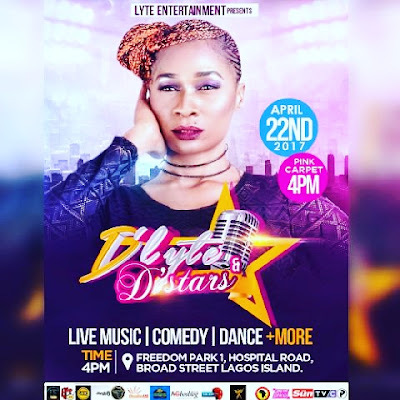 D’lyte and D’stars is designed to give hope to the upcoming stars also to help them meet with their role models and top heads in the industry. Come watch D’lyte and the stars from all corners of the industry perform live.